UHDTV to be name for both 4K and 8K television standard? The International Telecommunications Union (ITU) has finally come to an agreement about the future of TV. According to a new report, UHDTV (Ultra High Definition Television) will be the name for both 4K and 8K transmissions when they eventually arrive, despite the megapixel count of the formats varying so widely. Currently, 4K is the format that many filmmakers are choosing to shoot in. James Cameron and Peter Jackson have both adopted the format and are currently tinkering with frame rates to make their shots look even more realistic. In megapixel terms, 4K equates to an 8MP resolution ((3,840 x 2,160 pixels) while 8K dwarves this number. An 8K image is the equivalent to 32MP or 7,680 x 4,320 pixels. This is a whopping difference so it is a little strange that both will be called UHDTV. "This is the dawn of a new age for television that will bring unprecedented levels of realism." As this is a 'recommendation' at the moment, the fine print hasn't been set, so we may well see this category broken down much like what happened with high definition – which is at 720p and 1080p. There's no word on this in the original standard, however. "This is the dawn of a new age for television that will bring unprecedented levels of realism and viewer enjoyment. It's a historic moment," said David Wood, Chairman of ITU-R Working Party 6C. "Some years will pass before we see these systems in our homes, but come they will. The die is now cast, thanks to the untiring efforts of the international experts participating in WP6C." Currently, Toshiba is the first to offer a 4K consumer TV. The Toshiba 55ZL2 also offer glasses-free 3D and comes at a penny under £6,999. Sony also has a 4K projector, the VW1000ES, but 8K technology is very much in its infancy. 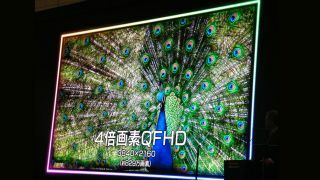 Sharp has showcased an 8K prototype screen - as has NHK, at numerous conventions – under the guise of Super Hi-Vision, a name that looks to disappear if this UHDTV standard is introduced.